This book aims to introduce beginning problem solving skills to both children and the adults who teach them. The solving of a challenging problem takes time and creativity. The goal is to guide all math circle participants, students, and teachers to welcome the time it takes to arrive at a solution. The purpose of this book is to invite parents and teachers to experiment with their own children or students, without any preconceived notions of how the outcome will look. Instead, the book allows personal taste and the children's feedback to guide them. A publication of Delta Stream Media, an imprint of Natural Math. Distributed in North America by the American Mathematical Society. Teachers, parents, and children interested in problem solving. It is a commonplace of teaching that you first try to teach the way you were taught. And so people pioneering math circles or informal learning situations often start out in the wrong direction, trying to apply to these situations the teaching methodologies that they experienced in formal classrooms. Julia Brodsky does a wonderful job describing other ways to teach. And maybe “teach” is the wrong verb: other ways to guide students in learning from and enjoying mathematics. 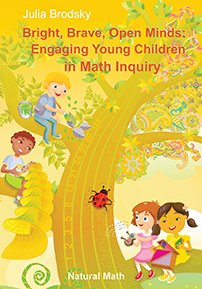 The mathematical examples are tailored to encourage children's exploration. … What I loved about this book is that it gave me a chance to impart so much more than information to my children—I soon understood that the underlying purpose was not necessarily mastery of facts, but an opportunity to teach them how to think, that it is acceptable to be wrong, and that sometimes there is more than one answer to a problem.